Sen. James Inhofe (R-OK) told 1170 KFAQ’s “The Pat Campbell Show” on Monday Obama lied about the Benghazi attack during his interview with Bill O’Reilly before the Super Bowl. Inhofe says Benghazi will go down as the “greatest cover-up” in US history. Sen. James Inhofe (R-Okla.) on Monday said President Obama lied about the terrorist attack in Benghazi during an interview that aired before the Super Bowl. Inhofe said the 2012 terrorist attack in Libya will “go down in history as the greatest cover-up,” and slammed Obama for claiming it was thoroughly investigated. “It’s just an outrageous lie. It’s kind of hard to call it anything else. It’s kind of like ObamaCare and the things he said in the beginning and now he’s denying it,” Inhofe said during a radio interview on 1170 KFAQ’s “The Pat Campbell Show,” which based in Tulsa, Okla. 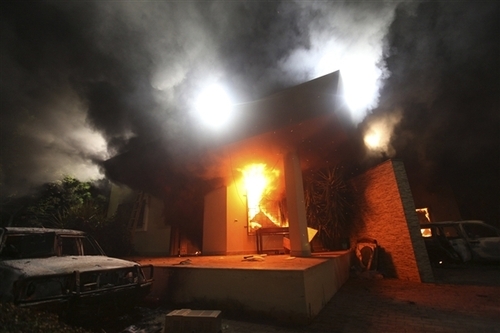 The 2012 attack on an American compound in Benghazi was staged on the anniversary of the 9/11 terrorist attacks and killed four Americans, including Ambassador Chris Stevens. Inhofe said Monday he “applauds[s]” O’Reilly for pressing him on Benghazi, and that Fox News is the only station that “isn’t virtually owned” by Obama. “I will say this till my dying day, I know people don’t realize it now, that’s going to go down in history as the greatest cover-up. And I’m talking about the Pentagon Papers, Iran-Contra, Watergate and the rest of them,” Inhofe said.